Dear readers! First off, I would like to wish you a happy New Year! May the upcoming year be full of joy, good health, peace and creativity. I'd like also to apologize for not blogging, and not responding to emails and comments lately - I've been too busy with my classes. 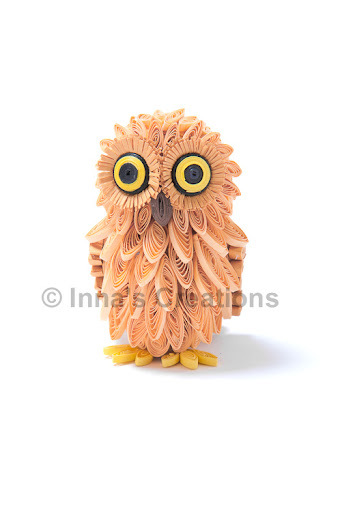 And now I'm going to show you a small and funny baby owl I quilled not long ago. I started by constructing the head and body with three-dimensional quilling techniques using approximately 1/4"-wide (5mm) paper strips. You can see the 3D base under the "feathers" in the photograph below (click on it to see a larger image). Then I created the owly eyes with the fringed flowers technique, and made the wings out of two large "teardrop" shapes using 1/8"-wide (3mm) strips. The beak and little tail were rolled up using narrow, just about 1/16"-wide (1.5mm) strips. Finally, I covered the baby owl with tiny feathers made of "eye" elements, rolled using 1/16"-wide (1.5mm) strips. 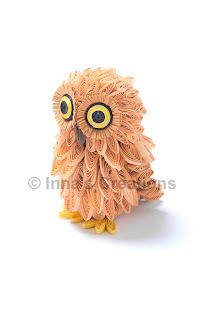 The legs are also made of "eyes", created out of narrow yellow paper strips. Height of the owl is approximately 1 7/8 inches (5cm). what a cute baby owl! :D ♥ you've did a great, amazing work inna! The baby Owl is adorable :). Beautiful work. Really cute!!! you have done a great job rolling such narrow strips for the feathers.It looks all the more adorable from behind with its tiny tail and wings. Очаровательная птюшка =) Вся такая распушенная, перышки живые, и глазищи огроменные! Fantastic, Inna - what a great owl! I love how you have shaped the wings and the tail feathers. Thanks for the love and a 2011 full of achievements, health, and quilling to decorate your creations with our eyes! Wow that is beautiful, what do you use to make him stronger, do you use a spray of some sort? Thanks for sharing. cute little owl!! Your work inspires me a lot. Thank you for sharing. Эта сова - прелесть! Рыжая бестия! Wow, I can't believe how adorable that is! I also can't believe how small! I don't know how you can work so small and pack all those quilled parts in there. It's an amazing, and representational, piece! The owl looks so cute and adorable inna. Happy new year to you!!! OMG, how adorable! I know someone who loves owls. I will have to show him :). Dear Inna your work is beautiful. I learn many things from your blog. I wish you a happy New Year with beautiful creations. And if you want, please, visit my blog. I am a beginner but I hope I do, in time, beautiful things. I wish everyone a very good New Year. Wow Inna! I came across your blog today when I was googling how to make paper dandelions. So glad I did - your work is stunning! May I ask what you do with your pieces when they're done? I assume they're for giving away? Nothing for this one, except coating inside the 3D elements with glue, as I explained in my 3D quilling tutorial. Sometimes I do use a matte varnish, I found Grumbacher's Picture and Oil Painting Varnish spray to be quite good. But you should experiment to find one that works best for you, of course. Susan, as you have guessed I give away most of the pieces I make. But I also keep very few of them for myself, usually these are small items like this owl. I put them into a transparent plastic box to keep dust away. Девочки, всем большое спасибо и еще раз с Новым годом! What a great quilled piece. I especially love how the eyes came out. Great Job and happy New Year! Your little owl is simply adorable. Happy New Year to you, and to Mr. Owl! That is SO good! You are a true quiller. Thanks for sharing! It's like Soren in the Legend of the Guardians!!!! Again you made me smile. Soooo cute. I'm just starting to make miniatures and what an inspiration you are! Thanks everybody very much! Your comments are a great award for me. 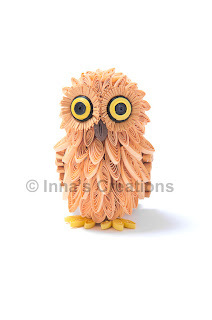 Lovely.. seeing this cute little owl, i was wondering, 'where does she get ideas like this?'.. I dont know abt u but for me u r my inspiration.. I hope u dont mind if i started off with trying some of ur ideas.. Your owl is absolutely precious. 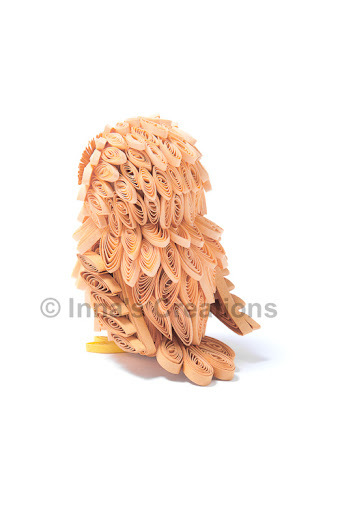 Can you post a step by step instruction for this owl? This is such a cute owl. So very creative. Hi Inna! Your baby owls inspired me to make some of my own. I posted them on my blog today- would love for you to check them out! very cute! 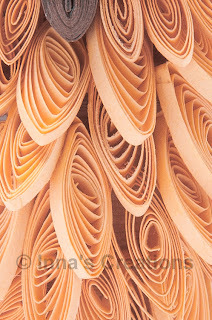 How did you make the base (inside part) do you think it would work to use a cork from a wine bottle (the kind that sorta looks like a mushroom)or would the quilling paper not stick? that is SUPER CUTE! making one for my desk but i can't figure out how to do the base. do you have a pdf or something so that i can learn how to do the form underneath the "feathers"
I made something like this, and covered it with "feathers", but you can use a wine cork for the base. There's a link to a PDF on 3D quilling in the post. Wonderful work! It's a delight to see. Could you just tell me, did you make the bases for the head and body the same size? (if you used some support or not) ,if its not a problem.Thank you.